Many game and activity suggestions to get children moving day after day along with a new song, tips to build your own “get moving” corner, and so much more. Word flashcards, coloring pages, activity sheets, stationery, posters with game ideas, and everything you need to keep children active. 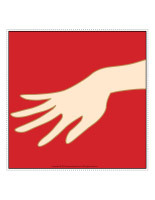 (Open thematic poster-Let's get moving) Print, laminate, and display all kinds of posters. (Open educa-decorate-Let's get moving) Print, cut out, and laminate. Use the items to decorate the walls of your daycare and set the mood for the theme. (Open garland-Let's get moving) Print and let children decorate the various items. Cut them out and use them to form a garland that may be hung within your daycare or near your daycare entrance. Set up a special corner within your daycare. It may, for example, include a miniature trampoline, a few hula hoops, a balance beam, and an exercise mat on which children can practice somersaults. Children will appreciate having the opportunity to use this corner as an outlet for their excess energy. You may be surprised to notice how this corner decreases the number of times children need to visit your "thinking corner" and the occurrence of inappropriate behavior. The educatall team has prepared a special activity-filled week for little ones. You can present the activities one after the other or, if you prefer, simply pick and choose the ones you feel your group will enjoy most. 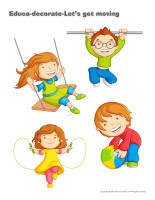 Have fun discovering new ways to be active with children. To introduce the theme, we suggest presenting a short series of aerobic exercises that you can perform together, as a group. 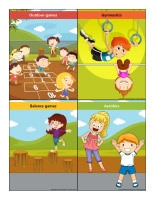 (Open games-aerobics) Print and laminate the cards. They will inspire you to integrate a variety of different moves. (Open activity sheets-Let's get moving) Print and follow instructions. 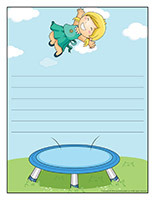 (Open writing activities-R like restless) Print for each child or laminate for use with a dry-erase marker. (Open stationery-Let's get moving) Print. Use the stationery to communicate with parents, in your writing corner, or to identify your thematic bins. (Open educa-nuudles-Let's get moving) Print for each child. Have children color the sheet. Once they are done, they may use Magic Nuudles to turn the coloring pages into three-dimensional works of art. Variation: If you do not have Magic Nuudles, ask children to fill the spaces designed for Magic Nuudles with bingo markers or stickers. To order Magic Nuudles. 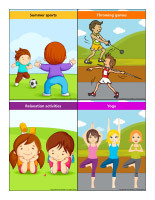 (Open sequential stories-Yoga) Print and laminate the various cards. Children must place them in the correct order. (Open perpetual calendar-Gymnastics Day) Print and use the calendar to display the day, date, and month of your Gymnastics Day. Invite parents to dress their child in loose, comfortable clothing for the occasion. Set large beach towels or exercise mats on the floor of your daycare and use them for a variety of activities. If you wish, you may even let children eat their lunch and snacks on their exercise mat for the day. (Open Game-This is my spot-Let's get moving) Print two copies. Laminate and cut out the cards. Glue one copy of each card on the table using adhesive paper. Drop the other copies in a bag. Children take turns picking a card to determine their spot at the table for the day. You may also use the cards to determine naptime spots or for your task train. (Open my body part path) Print, laminate, and arrange the illustrations on the floor to create a path that leads to areas children visit regularly throughout the day such as the bathroom, the cloakroom, etc. If you prefer, use the illustrations to delimit your various workshops. Ask parents to plan to stay with their child for 10-15 minutes in the morning or at the end of the day so they have time to take part in a group exercise session. Invite parents to take turns leading a short exercise session in the morning or at the end of the day. Some parents may have talents you didn't know about. Older brothers and sisters may enjoy playing this role too. They have most likely been introduced to interesting exercises at school. For this theme, we encourage you to introduce your group to a wide range of physical activities. This theme can last one week or an entire month. You can even use it for inspiration throughout the year to keep children active. 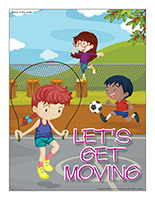 (Open Let's get moving games) Print and laminate the posters in both formats. 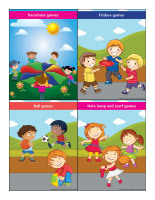 Use the larger posters to present daily activities to parents and your group. The smaller posters can be used to have children pick an activity. Simply insert them in a special envelope. Whenever you take the envelope out, children will know what kind of activity is coming. Hold a hula hoop in your hands, indoors or outdoors. Children stand single file and take turns walking or jumping through the hula hoop. Once everyone has had a turn, lift the hula hoop up higher for the next round. Alternate between holding the hula hoop up high and down low. Give each child a hula hoop and ask them to spin it around their waist, keeping it in motion for as long as possible. Invite children to stand in a circle and hold hands. Introduce a hula hoop between two children and close the circle. The goal of the game is for the hula hoop to travel all the way around the circle, but without children every letting go of their hands. They will have to find the solution. Spin a hula hoop in the centre of your playing area. Children take turns turning the hula hoop to keep it in motion. Divide your group into teams of two children. Invite the children from each team to sit face to face inside a hula hoop and swing back and forth as if they were in a boat. You can encourage them to sing Row, row, row your boat at the same time. Use hula hoops as targets to give children the opportunity to practice their throwing skills with balls and bean bags. You can easily hang the hula hoops on a wall or fence or simply deposit them on the floor, a few feet away. Stretch a long rope out on the floor to represent a balance beam. Invite children to imagine that the rope is suspended, high above the floor. Encourage them to walk on the rope, barefoot. They mustn't place their feet beside the rope. If they do, they have fallen off! You can have children walk backwards on the rope, jump up and down on it, crawl on it, etc. Variation: Use colourful electrical tape to draw a long rectangle on the floor to represent a balance beam. Ask children to perform a variety of moves on your balance beam. Provide examples. Like a tight-rope walker in a circus, have children walk on a line drawn on the floor while holding an umbrella or a stick in their hands. Place a small bench, a recycling bin, or any other object you may have upside down on the floor to represent a horse (gymnastics). Show children how they can jump over it, placing their hands on the horse. 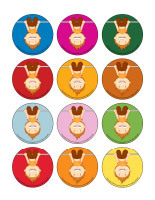 Set exercise mats in a row on the floor and invite children to perform somersaults on them. Once they have mastered forward somersaults, help them execute backwards somersaults. Help children execute handstands. One at a time, invite them to place their hands on the floor and gently raise their legs, holding their ankles. Set a variety of objects on the floor. They mustn't be too high. 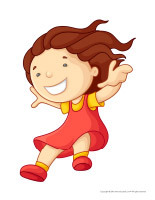 Children must jump over the objects, with their feet together. If you prefer, you may simply have them jump inside hula hoops. (Open complete the drawing-Let's get moving) Print for each child. Children must draw the missing details. (Open I am learning to draw-A character) Print and laminate the model sheet. Invite children to practice their drawing technique on the model sheet before attempting to draw a character on their own. (Open coloring pages theme-Let's get moving) Print for each child.